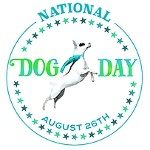 National Dog Day is an annual holiday celebrated on August 26. Its founder is Coleen Paige, Pet & Family Lifestyle Expert and Animal Advocate who has also created a number of other animal-related observances. National Dog Day was founded in 2004. It's main goal is to raise awareness about the need to rescue unwanted dogs. Each year, millions of dogs become homeless because they are unwanted. A lot of people don't realize that being a dog owner is a huge responsibility. They buy dogs as gifts for their kids or living toys and then throw them away because they bark or shed too much, demand care and attention. National Dog Day aims to encourage people to adopt dogs from shelters and rescue organizations. If you already have a dog and don't plan to adopt another one, you can celebrate it in other ways. For instance, you can volunteer at your local shelter, donate to animal welfare organizations, spend some quality time with your dog, buy your dog some treats or a new toy, etc. National Dog Day is about providing dogs with love, compassion, respect and protection they deserve. Every year, numerous events are held on the occasion of National Dog Day. The holiday is actively promoted in the social media. A lot of additional information about the day and ideas for celebrating it can be found on its official website NationalDogDay.com.